And then there were three. It can't have been much more than a year or so ago that the three-song EP by the artist formerly-known as Cynics was reviewed by Alter The Press. The consensus was distinctly related to the sound reminiscent to Against Me's very olden days with something of a youthful British vibe. The band's tripling in size has enabled them to re-work and generally amplify the tracks and inject them with some revivifying juices. The "pub-anthem" aura is still there, only it's backed up by some bouncy bass, uncomplicated drumming and healthy doses of female vocals. "In The Valley" becomes a short driver of a song packed with hopeful lyrics and vocals that really make it stand out like never before. At first, "14 Coleman St" comes off as something of a middle-of-the-road pub-punk song whose lyrics slowly inject more emotion as the track progresses, but the band hit great with final track "You're Alright". It's previous acoustic counterpart was a sweet and heartfelt sing-along and its even more compelling with the band's new electric sound, in fact the truly emotional crescendo of a finale is only amplified by the band's capacity to truly flesh out the rock within. Cynics managed to create a modest but thoroughly enjoyable three-tracker but it's not just the name that's become "GREAT", they've proven this by injecting new life into old tracks. A British talent band to follow. 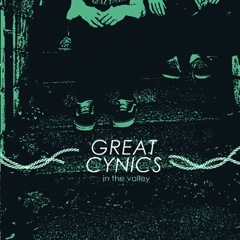 "In The Valley" EP is released February 28th through Kind Of Like Records.